Born on Vlemoth Port’s Mandalorian Settlement, Arumorut, Sirius Invictus spent the first years of his life dabbling in Mandalorian history, combat training and war tactics. Subjects in which he failed. Branded, both for his inability to follow procedures set centuries before his birth and for his blantant refusal to conform to their way of life, Sirius was considered an outcast among the settlers. This situation proved to be extremely challenging especially for the child’s father. Sirius’ mother, Mira, had left the settlement, and many believe the planet itself, the night of his birth. She had tried to take him along with her but she was stopped by his father; Achenar. Achenar, being a man of principle, deemed her behaviour treacherous and demanded to know the reasons behind her actions. She claimed that she was fed up with their life, and that there was more than war and profiteering out there; a life worth living, and the only thing that stood between that life and her was a choice. A choice she offered him as well. Achenar lunged at her and tore the baby from her embrace. Mira struggled and Achenar pushed her on her back. He let out a sigh and spat on the ground, telling her that she was lucky she had given him a healthy son; and that she had 10 minutes to disappear from his sight. This was years ago, but Achenar felt the same way he did that day. Even more so now that his son proved to be another source of shame in his family. Never being able to pique his interest, the father grew weary and at the age of nine stopped Sirius’ training. Sirius spent his days in search of books to read. Whatever he could get his hands on from philosophy to literature! He pestered travelling salesmen and peddlers to lent him copies of books or holobooks; to share stories of the galaxy. When he wasn’t reading, he was drawing and writing in his journal. What he saw, what he heard, every little tidbit of information and rumor he could get his hands on. While the tale of his mother’s “betrayal” brought shame to his father, to him it was an inspiration. It was the only thing he had that was hers, and the only thing he liked in the settlement; the fact that his mother was here before him. Even never having met the woman, and based solely on the rantings of his father or the occasional reluctant praise of their neighbors, the boy found himself thinking about her almost every day. Trying to draw her again and again in his journal in the futile hope that the finished picture would somehow spark a light of recognition in his mind. He wanted more out of this life. Having nothing other to do in his free time but studying, that inspiration finally lit a flame. He had made his choice. In fact he was deprived of that choice that very night his mother left. When he was not failing at training segments, he roamed the settlement, each day he strayed a little further, hoping to catch a glimpse of the unknown. So; he made a plan. First he asked his father to put in a word with the settlement’s mason. He claimed that since he cannot prove his worth in combat, he would be happy to assist in other ways. His father, having grown desperate with his son, agreed. The very next day he was assigned to mason’s Liberar crew, albeit for training but it was the first step of the plan. In the following months, the boy showed unusual promise, at least unusual for his reputation. After a couple of months, Sirius started proposing alternative ways of construction to Liberar; and while not always on point or on agreement with the mason, the alternatives proved to be worthy of notice due to different reasons. Some cut back expenses, while others made the labor easier. As the time passed the mason started to personally train the boy in case some day he is to take over as mason. But alas, this was not the boy’s intention. After six months, the mason started taking Sirius with him for contracts in the city. Around that time word had it that the Luf virus, that had spread a couple of years ago was once again affecting the region. As it was obvious many panicked, and soon the need of more beddings for hospitals arose. Liberar’s crew was tasked with building quarters around the existing hospitals of Sanshur Flats so that they would be able to house more patients. Sanshur Flats was the most advanced industrial city on Vlemoth Port. And the one with the most spaceports. The crew was to work for 16 hours, with four 1 hour intervals, relax for 2 and sleep for 6. Sirius, being the youngest of them all, sometimes managed to come to certain agreements with them: he asked Liberar to work for 16 straight hours, and get the 4 hours reserved for the intervals as full time to go to the city and explore, reassuring him that he would try his best to be back by the end of the day to sit with them for 2 hours and sleep the full 6 hours. Even if he was a little skeptical, the old mason let Sirius have his way. Sirius worked for 16 hours, filling in for others while they had their break. At the end of the work day, even after hours of exhausting work, Sirius took his journal and his satchel and left in a hurry. He had a window of 4 hours to find a way out of this planet. He would be a crewmember, a stowaway even a pirate to get out of there. Of course then he would quit. Would they let him quit? They would be pirates after all. He shook he head and tried to calm his breathing. He tried to not think about how afraid he was. He asked around and eventually found his way to the spaceport. Once he was there it would be easier, he would eavesdrop on conversations and try to appeal to captains for a job or watch out for unsuspecting crewmembers and try to board a vessel anyway. He would– Screams. Screams filled his ears. People ran out of different corners of the streets, they held signs and makeshift weapons. The signs had all sorts of messages concerning the virus and accusations of the virus having alien origins. The planet’s main population was Humans, Muun and Talz. Now Rodians, Trandoshans, Nautolans and even Cathar refugees could be seen fleeing the wrath of the mob. In a few seconds the situation seemed to be out of control. Sirius took turn after turn, leapt from shadow to shadow while trying to recall even a small bit of memories of his training. The teachings he had forsaken could prove to be handy right now. Luckily all the commotion had the various officials of the spaceport trying to diffuse the situation and they would hardly spot a child among the chaos. While trying to slip past a guard and onto an empty vessel, he caught glimpses of what was transpiring on the streets, people cried in fear as they were being chased, blamed of being foreigners. At least the local authorities seemed to be able to handle the situation better than it would be expected. That being said, even they weren’t able to be everywhere at once. Thinking that, Sirius turned again towards to ship.. And everything blacked out. He felt, the anger of many people, but he could not understand of whom, or from where. He felt the fear of many as well, again not being able to pinpoint that fear’s origins. He could not walk, think, it was as if his mind was taking notes and at the same time as if the world had stopped. Then suddenly, overpowering every other stimuli, he felt the terror of one person. It reverberated around him, through him, penetrating his very soul. He felt that person near him, he felt the agony, he felt a pull. He reached out… And everything appeared again, the streets where filled with debris. The guard was still talking to the crowd. Sirius, was frozen solid, cold sweat running on his temples, his heart racing and his hand outstretched towards the alley ahead of him. And there he found the source of the feeling. A girl was trying to outrun a group of people, and she was entering the alley Sirius was in before, but that alley was a dead end! Without knowing why, Sirius knew she was the one he felt. He looked at the guard; he was still trying to calm several civilians. He turned his gaze to the alley, the girl was dazed. She had realized there is no way out of there, and the others were closing in. His eyes darted back to the guard who was reaching for the remote on his belt, the girl was crying, the guard pointed towards the ship’s doors, the girl cowered. Sirius sprinted towards the people surrounding the girl, there were two men and a woman, he slid over the debris and under the feet of several people. He saw one of the signs lying down on the street, grabbed it and letting out a growl, he lashed at one of the men, aiming for his back. He lost his balance as the sign was too heavy and instead struck him in the knee. He then went under the man’s outstretched arm, positioning himself between them and the girl. The man let out a scream, and limped on his leg. He looked up to the boy furious. The man approached the kids and as he was about to strike the boy a sound pierced Sirius’ ears. A sound he would hear many times from then on. 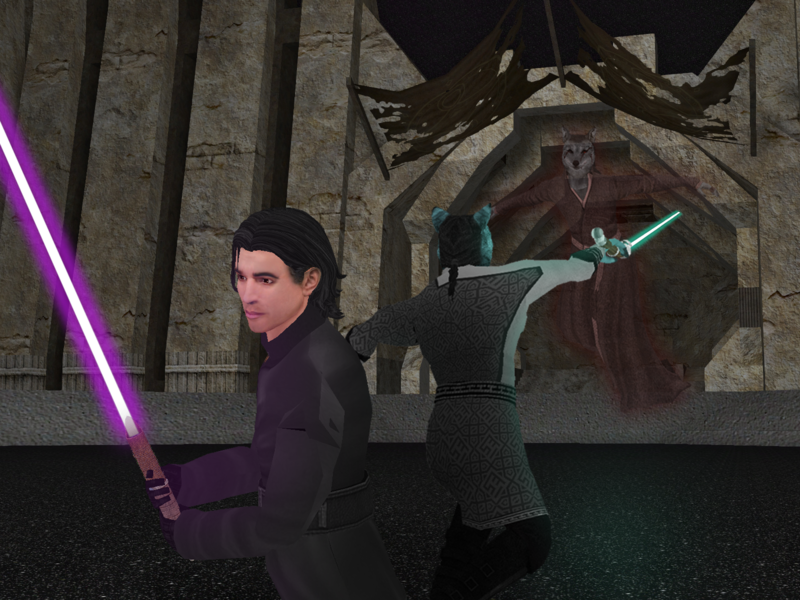 A hooded figure jumped from the rooftop above, a sword of purple light now blocking the man’s path. The man’s friends ran away, he staggered, his eyes widening in terror, and followed them. The hooded figure turned the sword off, turned around and lowered her hood. She told the children that she was going to protect them, but they would have to do as they were told. After she got them out of the city and in safety, she said her name was Isane and that she was a Jedi. After a pause she explained that there was a reason she found them; they both resonated with the Force. The kids, still unable to explain what it was they were feeling, were then given a choice. To follow the woman and train in the same ways she had, or stay in their current way of life. Sirius took the opportunity at once. After a holocall with his father, in which he told his son to do whatever he felt was right, Sirius turned towards the Jedi and told her that at long last; he was ready.